In the old days, consumers went shopping because they had to. However, thanks to a plethora of new options, consumers today must now be inspired to want to shop. To improve the customer experience, retailers are looking toward many different options, such as buy online pick up in store (BOPIS), click and collect and ship-from store. 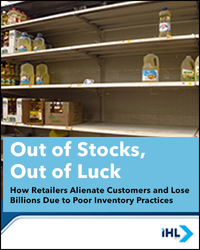 While convenient, these fulfillment methods have only further exposed the problem of out-of-stocks. Additionally, retail stock-outs have bolstered Amazon’s success in North America. In fact, a new IHL survey reveals 24 percent of Amazon sales are from consumers who first attempted to buy the products at their local retail store. Clearly, retailers are leaving a lot of business on the table.